Design education faces some important decisions. To what extent should it be about the study of the subject as well as its practice? Higher education in Britain contains a curious divide. On the one hand there are highly developed graphic design education programmes; on the other a sophisticated theorisation of communication through cultural and media studies. But the two rarely connect. This is largely the result of an historical divide in academia between theory and practice and between social sciences and the arts, with perhaps an element of snobbery and fear of the unknown thrown in. But it is a schism which creates bizarre inconsistencies. Television, for instance – as an institution, as a medium, its forms and genres, its audiences – has been thoroughly explored in cultural and media studies, but television graphics have been virtually disregarded, despite their crucial role in structuring the spectacle of television. Similarly advertising has received substantial critical attention in terms of gender, meaning and so on, but no equivalent interest has been shown in how its messages are communicated through graphics. Part of the problem may be that cultural and media studies have taken as their starting point ‘popular culture’ – that which was not deemed worthy of analysis, but was of great social consequence. Design, with its language of formal aesthetics and concern with star individuals, smacks too much of ‘high culture’ and so is to be avoided. But where in higher education should we position graphic design? It is an element of both mass communication and popular culture – the subjects of cultural and media studies – and one of the arts, with a history that can be traced in terms of creativity and aesthetics. On the whole, the arts-based approach has dominated and historians, despite attempts at more radical interventions, have subscribed to the traditional model of art history, structured by styles, movements and innovative individuals. This has helped to define the terms within which graphic design is debated outside education. While I am not suggesting that this approach should be rejected, there is another agenda to explore. A substantial body of analysis developed within cultural and media studies could usefully be applied to graphic design; key concepts to do with messages, audiences, ‘effects,’ ideology and consumption could all be brought to bear. Locating graphic design within institutional contexts (the press, broadcasting, publishing, museums) and identifying how its visual conventions have evolved would help to reveal the complexity of the cultural assumptions on which it is based. Semiology, with its vocabulary of codes and connotations and concern with mechanisms which produce meanings for readers, seems particularly appropriate. Roland Barthes’ essays on cultural readings of everyday objects and events could be extended to applications such as corporate identities, opening up a new area. There is a problem here, however. Many of the points raised by semiological visual analysis will come as no surprise to graphic designers. Most designers know (though they would not put it in this way) that images are culturally coded and have to be ‘read,’ and that the meaning of an image does not reside in the image itself. What are presented as crucial lessons of semiology appear to graphics students as ‘obvious’ – part of the design process. Yet while they may recognise this instinctively, it is a different matter to be made conscious of it. For designers to think about the methods and consequences of their work is to position it within the larger picture of social and cultural history. The importance of this level of awareness cannot be overemphasised, and the place to gain it is in education. A cultural / media studies approach might also temper some of the wild generalisations made by the graphic design community about technology. To position technology within a social framework, to question the dominance of determinist models which imply that technology drives social change, could move us beyond the standard utopian / dystopian polarities. Similarly, media studies research on audiences would call into question some of the more simplistic assumptions made by designers about readers, taking us beyond the encode / decode model in which audiences are supposed to read off the intended meaning of the designer, and showing how audiences are supposed to read off the intended meaning of the designer, and showing how audiences might read against an intended (or preferred) meaning, revealing a hierarchy of messages. This is not simply a matter of mapping a single, unified cultural / media studies approach on to graphics, but of testing and negotiating the relevance of a variety of theoretical bases and contested methodologies to specific examples of graphic design. It is a process that has barely started. In stressing the importance of the social and cultural context, we must guard against losing sight of the specificity of graphics, of collapsing it into ‘media’, but this is a problem of methodology, and the challenge lies in attending to both aspects of the discipline. I do not believe it necessary for the designer to deploy or demonstrate theoretical ideas in his or her designs, though to date this has been the way cultural theory has been addressed. I see the ideas I have been describing as contributing to the study of graphic design, as part of an educational aim of encouraging the critical awareness and politicisation of designers, as in debates about ‘responsibility’ and ‘accountability’ in design begun by some professionals. It is not necessary or even desirable for all graphics students to become experts in theories of cultural communications for their own sake, but it is important to study graphic design in such a way as to recognise its social and cultural relevance, to move away from the relatively secure ‘history of graphic designers’ to the more troublesome structures of social and institutional communications. The case for the history of graphic design is far from won in design education, but resistance to ‘theory’ runs even deeper. Education is a privileged moment for a graphic designer in terms of creative freedom, experimentation, research opportunities; it is also the place where designers cultivate an identity, a ‘position.’ A grounding in cultural / media studies can contribute to this crucial formative and reflective aspect of education. But what of the uneasy relationship between education and industry? To what extent should courses be about the study of graphic design as well as the production of graphic design? For many years, the assumed requirements of industry, always defined in terms of skills, have dominated arguments about the role of education. The dislocation between education and industry is not helped by the poor record of our professional organisations. Rather than addressing education, many student competitions and seminars seem to serve solely to project mainstream, professional values on to students. And the low status of graphic design educators means that they barely have a voice in the ‘real’ world. In the US, educators are well respected and are at the vanguard of debate. A number of leading journalists, who address professionals, have backgrounds in education; some have theoretical backgrounds. American educators might be surprised to learn that the body of research developed under the cultural / media studies umbrella in Britain barely touches our graphic design students, let alone professionals. 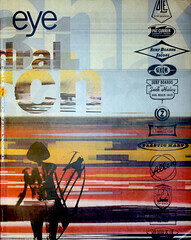 The comparison between the countries – demonstrated noticeably in the American special issue of Eye (no. 8 vol. 2) – is revealing. We are currently in the process of a radical reorientation of graphic design, and new initiatives in education are urgently required. A new discourse is emerging which speaks of social responsibility and awareness. Videographics and new media have forced educators to address time, sound and screen for the new contexts of broadcasting and interactive media. We are struggling to develop a critically engaged approach to technology and its hybrids. The electronic revolution has confused some of the old terms and definitions and blurred distinctions and categories. Even the term ‘graphic designer’ seems increasingly inadequate. This shift is not just about technology – it must also embrace educational ambition.